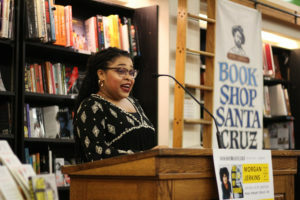 Jerkins’ talk was part of Santa Cruz Bookshop’s series on “Women’s Voices” following the emergence of the “Me too” movement. Jerkins spoke to an intimate gathering of about 60 people on Friday, Feb. 23. The excerpt Jerkins read from her book described a run-in she had with skinheads at a bar in St. Petersburg, Russia, while studying abroad for her undergraduate degree. Gripped with a fear many of her white friends did not share, she slowly and deliberately recounted how she ran out of the bar in a city she said had recently witnessed many hate crimes against black people. Stories like this and others all interacted with themes such as the cost of dealing with racism and the flawed nature of human knowledge. In the book and discussion, she argued it is important to respect others’ understandings of the world. Many in the audience were engaged with the intersectional feminist themes Jerkins touched on. Valéria Miranda, executive director of the Santa Cruz Art League, appreciated the complexity with which Jerkins discussed issues. “Many issues like race and feminism are not clean-cut, they’re not one thing or the other, they’re not binary, and she described [how] they’re very complex. […] I’m an immigrant, I’m multiracial, and that’s something that I really relate to because things are incredibly complex,” Miranda said. As an author in her mid-twenties, Jerkins said she never claims to have all the answers. She talked openly about her journey to her present opinions, even if not everything stuck to a comfortable feminist position. The inspiration for the title “This Will Be My Undoing” came out of a desire to unlearn old conditioning and unearth old memories. “[It] came from my fixation with words that start with the prefix ‘un-,’ so I love ‘unwinding,’ ‘unwavering,’ ‘unlearning’ and then ‘undoing’ […] it’s basically saying that I have to go back and unzip — or undo — those memories that had effects on my psyche for a long amount of time and to analyze them and show other people,” Jerkins said. The Bookshop Santa Cruz staff chose Jerkins to speak in the “Women’s Voices” series because of the thoughtful and insightful way she rethought cliche concepts in feminism. “Feminism isn’t something that we can just say this is what it is and be done with it. Morgan also came from a Pentecostal religion and that kind of blows apart our whole idea of what a feminist is — that you can be religious and be a feminist,” said Events Coordinator Chorel Centers. Jerkins wanted attendees to come away from the talk with a confidence to voice their own opinions while making space for respecting others’. “This Will be My Undoing” is available at Bookshop Santa Cruz and the shop’s series on “Women’s Voices” will continue through the year.